Most of the time this wouldn't be noticable, but it is a pain for those who might have their browser in large fonts, or visit the site through a mobile browser and regularly have to zoom in to see parts of the page. I don't think I need to say which is the horrible image and which is lovely HTML and CSS. 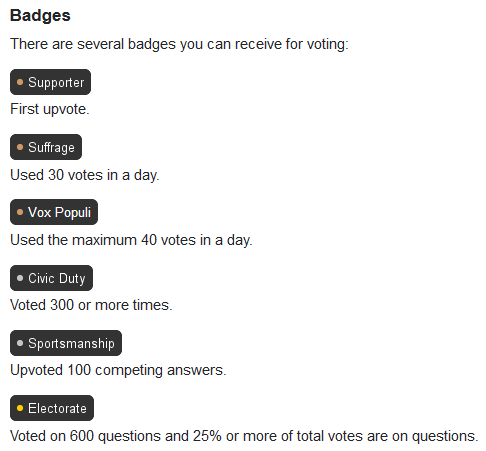 This inconsistency has been around at least as far back as the first mirrors of the pages on web.archive.org from 2013: the Badges page, on 2013-06-20 used HTML and CSS; the Privileges > Vote Up page, on 2013-07-01 used images. The Vote Up page should be amended to address this issue. Browse other questions tagged feature-request design help-center images .